Madley property are proud to present this stunning one bedroom apartment in this stunning Royal Victoria Docks development known as the Hoola. With a modern design that encapsulates luxury living and in amongst the huge regeneration happening throughout the E16 postcode, Hoola East Tower works for both owner occupiers and investors. Located a stone's throw from Royal Victoria DLR station and equidistant between the future Crossrail site at Custom House and the underground at Canning Town station, you have a wealth of transport links to get you around the capital. 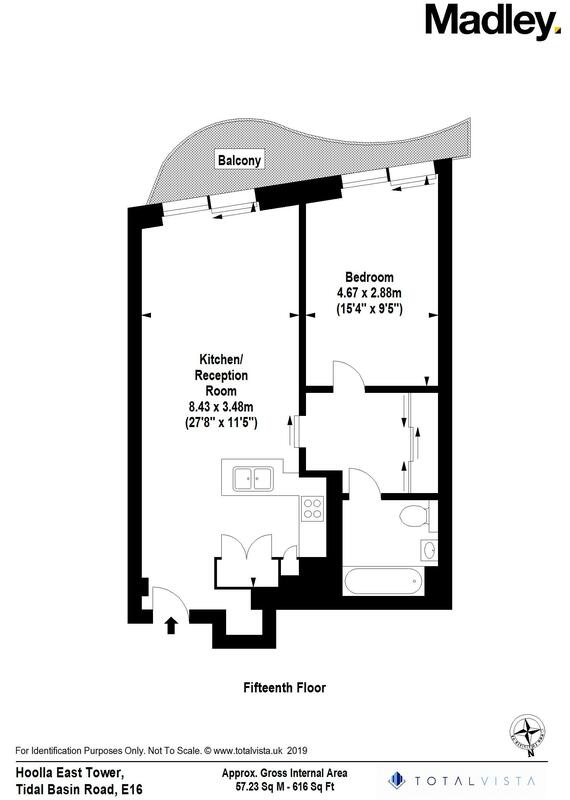 Laid out over the 15th floor, over 616 square feet, this apartment offers a superb finish with a spacious and bright open plan reception that incorporates a wonderfully designed and fully integrated kitchen with high-end appliances. A good size balcony that offers beautiful views of the O2 arena and royal docks can be found both in the reception and the bedroom, A well-sized bedroom and plenty of storage throughout. The bathroom is finished to a high standard. All Hoola East Tower will benefit from luxury living with all of the modern fixtures and fittings associated with a new build including a residents' only gymnasium, lounge and concierge service.